Prior to operation, an initial test of an amusement device in accordance with the designer’s instructions must be performed, witnessed by a competent inspection body. This test must be performed in addition to any supplementary testing of the device components and systems, which may have been completed previously during device commissioning. The initial test is carried out to ensure the safe working of the entire device. Safety systems are scrutinised with particular attention to evacuation of the device in the unlikely event of a failure. Designed characteristics such as design loads and operating conditions (e.g. wind loading) are considered, simulated and verified at this stage. Emergency access and egress is demonstrated to prove the environment is adequate for safe utilisation. Acceleration tests may be carried out to calculate that the forces exerted on the passengers and components do not exceed undesirable levels that have not been accounted for at the design stage. The restraint systems and door interlocking system should also be demonstrated to insure adequate measures have been taken that they do not open during operation. This system must be tested at this stage. More general assessments must also be carried out to ensure that hazards, such as tripping or trapping do not exist. The device must also be assessed for cleanliness so that regular visual monitoring of the device structure can be carried out safely and correctly. For a full description of initial testing please refer to Fairground and amusement parks – Guidance on safe practice (2nd edition), paragraphs 110-117. 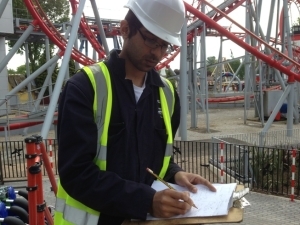 Inspection engineers at LTC have commissioned and performed initial tests on all kinds of amusement devices, and we are well placed to help you to fulfil your legal requirements to get your amusement device up and running. For more information, please contact us.